Of all the great things that have been said about Boeing’s mighty 747, that simple observation probably says more for the people who designed, built and maintained the Queen of the Skies than any other. Specifically, it was made by a Mr. Robert Craig Butler about the way 747-122, tail number N4713U, roared out of Honolulu for San Francisco just six months after a cargo door failure and explosive decompression had torn a huge hole out of its forward fuselage. The fact that a 747 could sustain the damage it did and be flown back to a safe landing is incredible in itself. The fact that it could be repaired, returned to service and continue flying with such sparkling performance – even more so. Mr. Butler was on the team that did that work. It was an amazing experience for all involved. And the jet roaring over their heads that day was the ultimate accolade for the recovery team. By all accounts, their mammoth repair job was flawless. Every wire, every line, every piece of metal and every rivet would serve without complaint for another 15 years. By his own admission, Robert Butler really landed on his feet. Getting drafted in 1964 wasn’t everybody’s idea of a lucky break. But it certainly worked out for him. When his number came up, he had just finished a lacklustre high school career. He didn’t really know what he was going to do next, but when the call came from Uncle Sam the young man knew his upbringing in Carson City, NV was no preparation for either crawling in mud or putting to sea. So it would have to be the Air Force. Surprisingly, his USAF entrance tests revealed a hidden talent. ‘We’re going to make you a jet mechanic’, he was told. ‘What’s that?’ he replied. In its own unique way, the Air Force soon let him know. Butler wound up overhauling McDonnell F-4 Phantom II engines in Tuscon, Arizona for three years, but chose to leave the Air Force when his time was done. Back home in Carson City, he saw an ad for A&P Mechanics to join United Airlines at its SFO maintenance base, so he and his brother drove down to San Francisco for the interview. He must have made a good impression because the airline asked him to return the following day for further assessments. But this wasn’t in the plan! The two young men would have to spend the night in their car, getting what sleep they could, in order to make the unexpected appointment. Luckily the good folks from United found out and provided hotel accommodation for them both. Needless to say, Robert got the job. 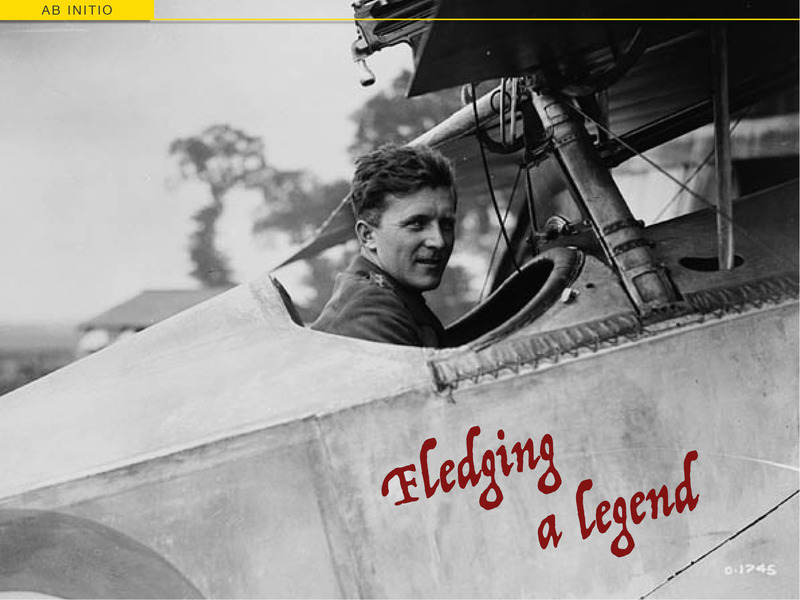 He was now a United A&P, working on their growing fleet of wide-body jets. Butler would also routinely sign up for EFS – Emergency Field Service – when he clocked on each day (or night). EFS meant going wherever a jet needed them, usually to replace an engine. In fact, Butler and his colleagues became highly skilled in the art of changing big jet engines in the field. 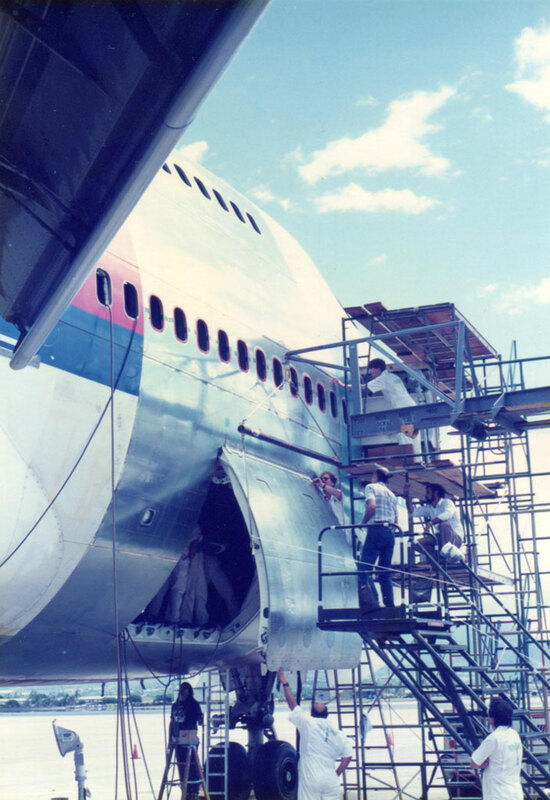 For a 747, they had the process down to a matter of hours; and they developed a system that allowed them to change tail-mounted #2 engines on DC-10s without the specialised lifting equipment of a maintenance hangar. It saved the airline a bundle in revenue hours. 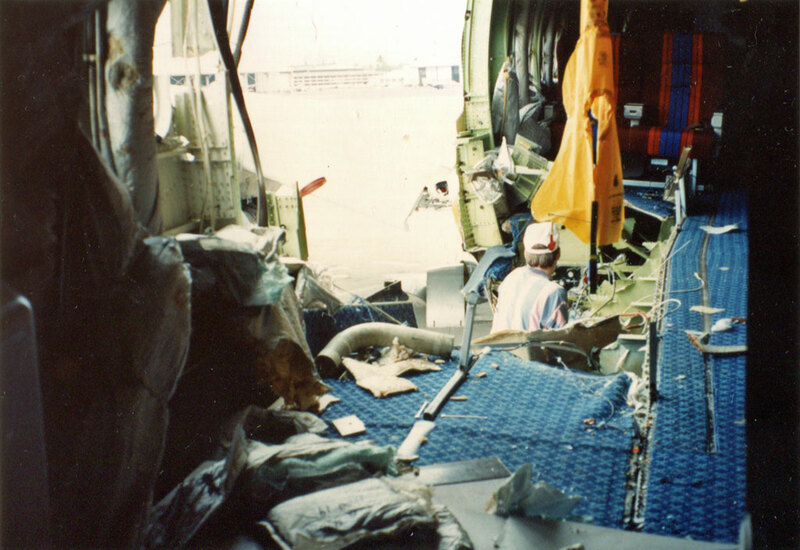 A PBS vidcap showing inspectors examining the damaged jet from a scissor lift – effectively the reverse view of Butler’s interior shots below. 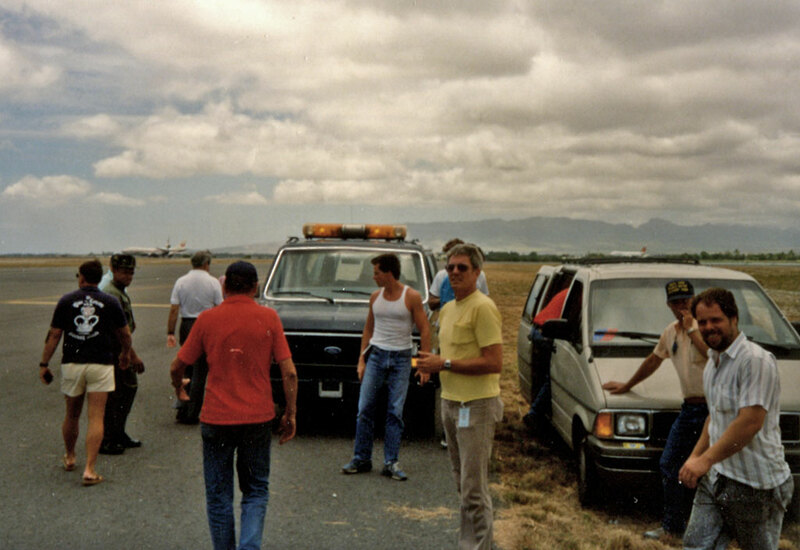 And volunteering for EFS was how Robert Butler and eight of his colleagues found themselves on a flight to Honolulu at the end of February 1989 – off to repair the most devastated 747 that had ever returned safely to an airport. That aircraft was N4713U, msn #19875, which had been in service with United Airlines since November 1970. While she was operating as United flight 811 to New Zealand on February 24th, 1989, a faulty wiring bundle had unlatched her forward cargo door at 22,000 feet. The explosive decompression tore a huge piece out of the right forward fuselage, blowing debris into the leading edges of the right wing and empennage, as well as both the #3 and #4 engines. Although nine lives were lost in the initial blast, and both right-side engines had to be shut down, Captain David Cronin and his crew skilfully flew their crippled jet back to Honolulu for a safe landing, saving the remaining 346 souls on board. It was probably this feat of airmanship, rather than any practical cost-benefit analysis, that drove United’s decision to repair the airliner rather than write it off. So an EFS team was flown out from San Francisco. Naturally, Robert Butler and his colleagues knew about the accident and had seen initial media coverage showing the damaged airliner. The morning after they arrived they were shown the jet, inside and out. The huge, gaping tear in the 747’s fuselage left the nine maintainers awe-struck. Passenger seats hung onto the edges of the hole; other seats were clearly missing. The dubbed their operation ‘Project Dutch’ – from the nickname of United’s Senior Technician and Foreman in Hawaii, who’d be their ‘handler’ on the island – and set to work. The first problem was where to work. United didn’t have a hangar at Honolulu, and the airport didn’t have any long-term parking space for the jet. The NTSB had had the aircraft towed onto adjacent Hickam Air Force Base (Hickam shares a runway with HNL) but the Air Force weren’t keen to have it parked there for months while the civilian crew repaired it. N4713U on the tarmac at Honolulu, shortly after the United 811 incident. Note the rudder position – evidence of the ever-present winds. In the end, the dilemma was solved in a time-honoured fashion – barter. The Project Dutch team offered to give Base Command all the metal and other parts they removed from the airplane, so the Air Force Fire Department could test their cutting equipment on the scrap. When they’d finished, they’d be free to sell the scrap and use the funds to improve facilities on the base. It was the kind of deal that gets things done. “From then on, the Air Force guys were as helpful as you could want,” Butler recalls. They simply asked the United team not to look too hard into open hangars, or to use their cameras on the base. “We took our photos anyway,” laughs Butler. With nothing but an exposed hardstand for a workshop, the A&Ps were advised to position their damaged charge with her nose pointing into the wind. This they duly did, getting the tug driver to park N4713U facing southwest toward the sea, where the winds were coming from. A couple of hours later, some Boeing engineers pointed out that Hawaii’s prevailing summer winds were actually Northeast Trades and they should get the jet turned around. A tug was swiftly borrowed from the Air Force – and the NE Trades blew consistently from the very next day. It was a lucky break. But if the winds could change once, they could change again. So, to minimise the danger of the big airliner weather vaning into every gust, it was decided to remove the vertical stabiliser. This would be no simple task in an open, windy work space: A 747’s tail towers 19.3 metres (63 feet 5 inches) above the ground – and the actual tail surface makes up about half of that height. (The rest being fuselage and ground clearance.) 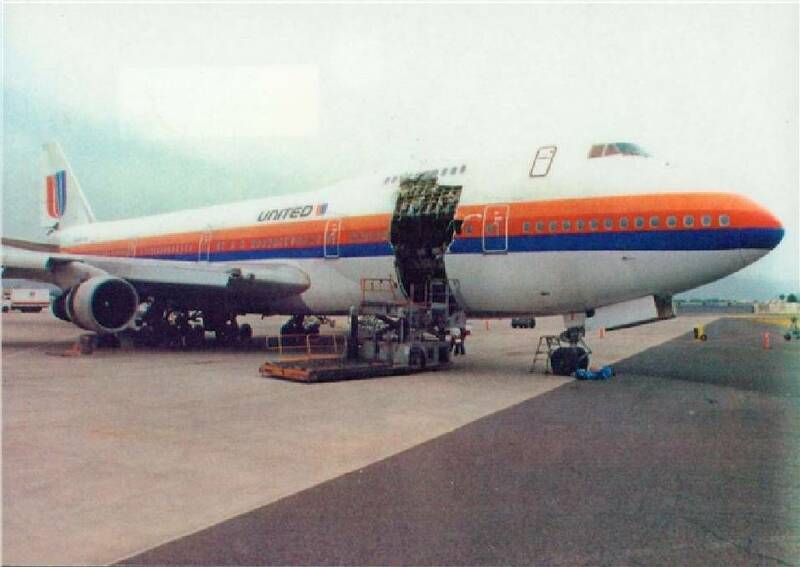 What’s more, no-one at United had ever removed a 747’s tail before. Fortunately, Boeing’s engineers were able to lend Project Dutch the relevant maintenance manuals and a tail sling flown out from Seattle. 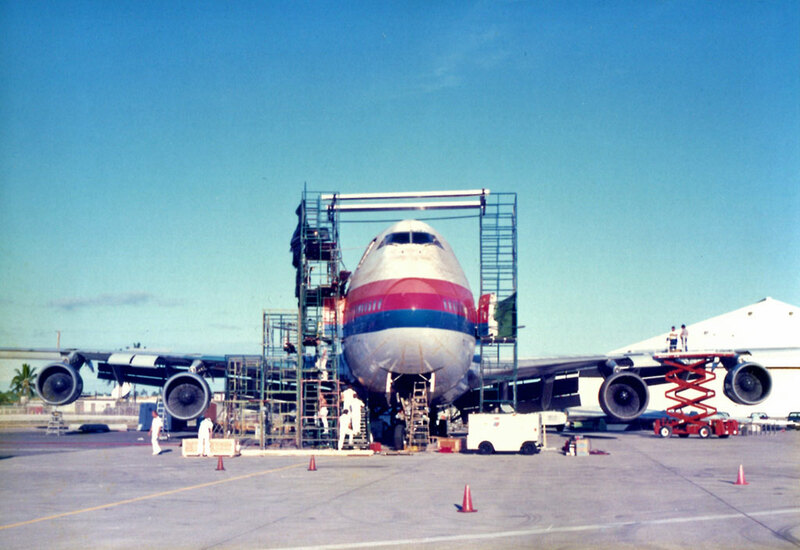 So, with the help of a large mobile crane and its skilled local operators, Boeing’s and United’s combined team lifted the massive structure clear (with the finely balanced rudder still attached) and laid it alongside the airframe for the duration of the project. Now they could really get to work. Repairs to N4713U fell into three broad areas – fuselage, flying surfaces, and engines. It was obvious that engines #3 and #4 had ingested airframe parts, cabin debris and more. 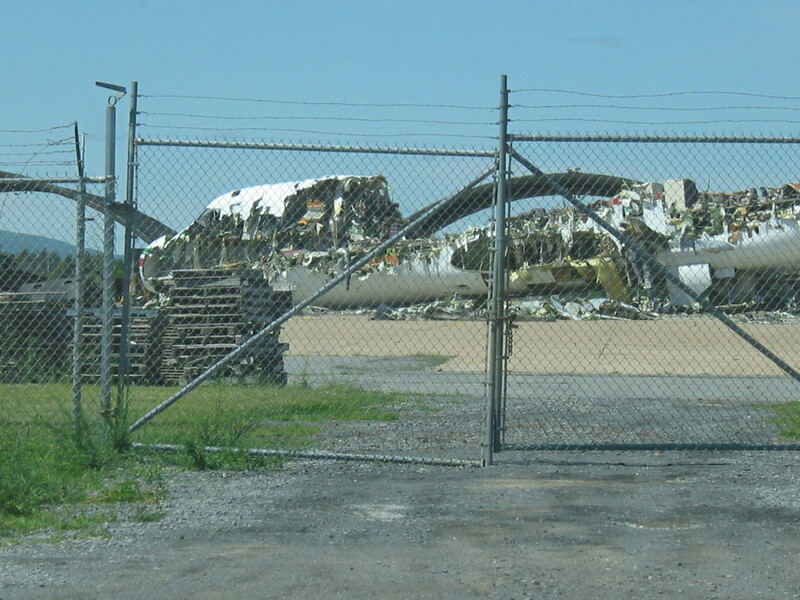 The United A&Ps would remove all four engines, but #3 and #4 were impounded by the NTSB. As part of the process, the engines were flushed out with water and the water was captured and strained. Butler confirms that human remains were recovered from those engines in this way. Apart from that though, the experienced crew worked their way through all four power plants without any problems. They also went through the fuselage and stripped the cabin bare. “Everything came out of the airplane,” recalls Butler. “I mean we cleaned it out, right back to the skin. Seats, fittings, furnishings and insulation all came out. It was a bare shell. Meanwhile, the team from Boeing worked on the major airframe repairs. As the maker’s representatives, they took charge of the engineering assessments and structural remediation. Contrary to some rumours, a new nose section from an Air India 747 was not fitted to the hull. The engineers spliced new sections onto the existing hoops, stringers and other structural members, and fitted new skin plates. Internal systems were similarly repaired. Butler returned to California for health reasons as the United and Boeing teams continued to repair the damaged flight surfaces. That included re-skinning sections of the right wing, #3 and #4 engine pylons, aft fuselage, right horizontal stabiliser, and vertical stabiliser. 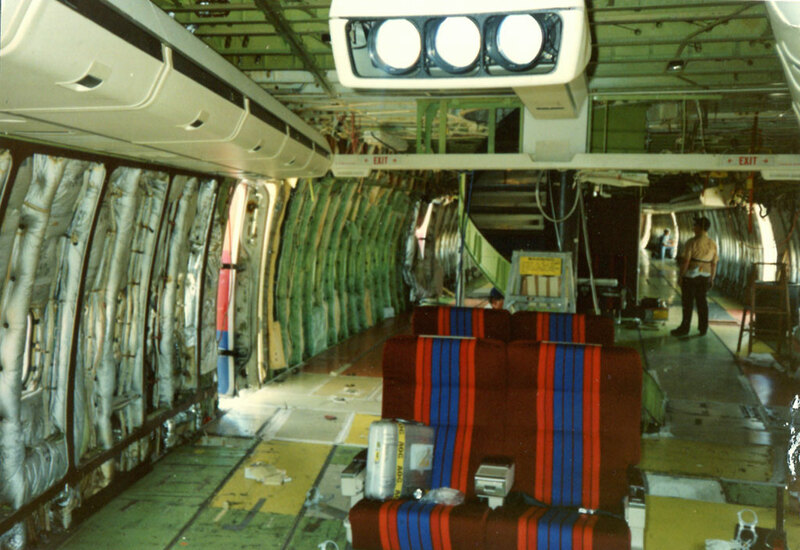 The sub-structures also had to be inspected; while more complicated systems like flaps, leading-edge high-lift and anti-icing systems, and spoilers all needed to be repaired or replaced. But Robert Butler did make it back to Hickam in time to help fit and test four new engines, ready for the airliner’s ferry flight home. He had been there at the beginning and he was determined to be there at the end. Then, following all the inspections and repairs, every system was tested for flight-worthiness. 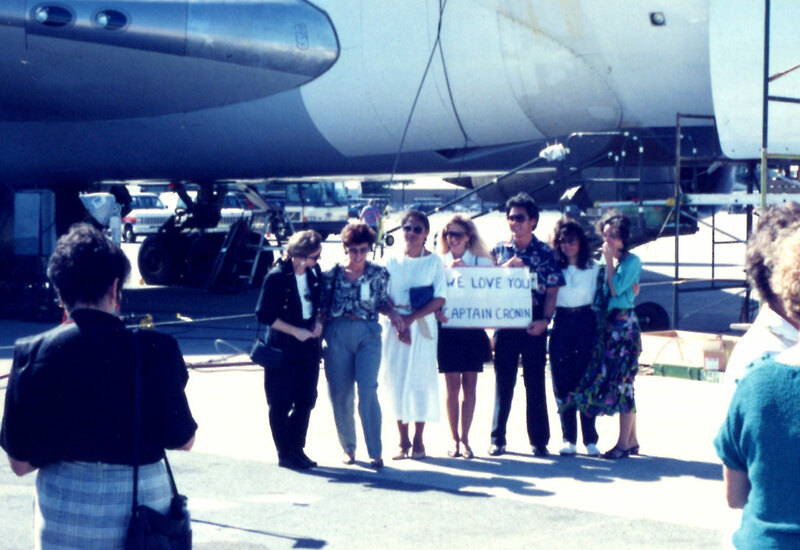 The project was completed with a traditional Hawaiian ceremony where the cabin crew of United Flight 811 were reunited with their jet, while a Kahu wished the restored 747 many more safe takeoffs and landings – a blessing she would certainly receive. That memory has stayed with Butler ever since. In all, it was an incredible amount of work and it was all done in the open, on an exposed hardstand 2,400 miles from the crew’s main source of parts, reference materials and tools. Everything they’d need – from new engines to an AN365 nut and the wrench to tighten it – had to be anticipated and brought out from the mainland. To their lasting credit, the team completed ‘Project Dutch’ in under six months. And when they finally packed away their tools, #19875 was virtually good as new. By mid-August the airplane was ready to fly back to San Francisco for refurbishment. She was still a bare shell – apart from fuel, the flight crew was the only weight on board when she finally accelerated down the Honolulu runway, for the first time since February 24th, and leapt back into the air. At that point in time, she was probably the lightest, strongest 747 that ever flew. Quite rightly, Project Dutch stands as the highlight of Robert Butler’s career, even edging out his military service. It was a grand adventure, an extreme proficiency check and, ultimately, a crowning success. He is justifiably proud of what was achieved during those months in Hawaii. And his pride is as strong today as it was on the morning at Hickam AFB, when he watched N4713U return to the sky “like a fighter jet.” Like a phoenix. N4713U would spend another month in United’s San Francisco maintenance shops, being completely overhauled and fully refurbished for passenger service. In September 1989, United re-registered her as N4724U and flew her with that tail number for another eight years. As the airliner continued in service the inevitable signs of ageing became more and more evident, until she was retired in January 1997. Then, in March 1997, she was purchased by Gambian millionaire Babani Sissoko to be the flagship for his rather questionable Air Dabia operation. 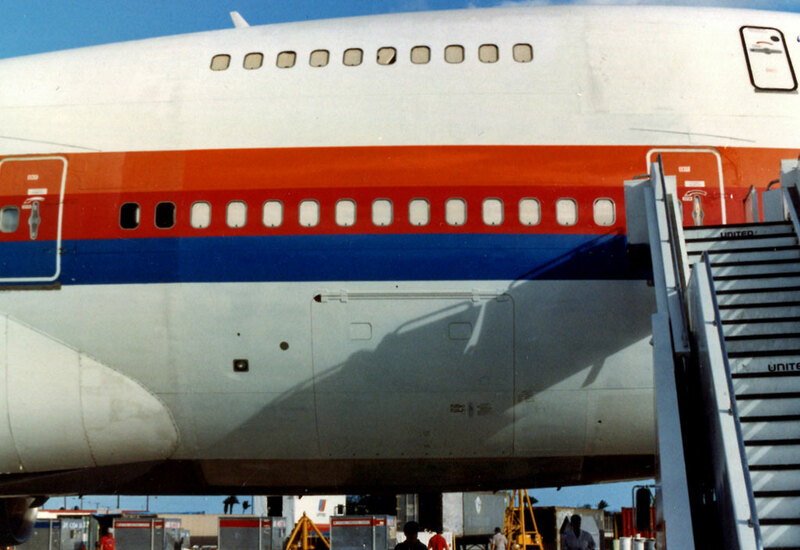 In the end, this Queen of the Skies retained her dignity for another 15 years. 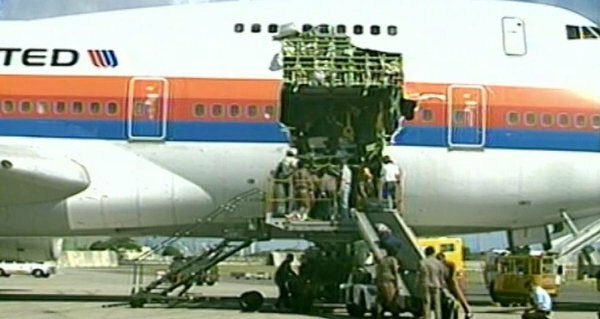 No-one ever found reason to fault the extensive field repairs that the United and Boeing engineers made in Hawaii back in 1989. Fate handed those A&Ps an unforgettable experience, and they acquitted themselves magnificently. Most of the passengers she carried in her ‘second life’, and even many of the crew, had no clue of the aircraft’s earlier brush with disaster, or the efforts of men like Robert Butler – the team that returned her to such remarkably unremarkable safe service. And I like to think that when the scrappers finally did tear #19875 apart at Plattsburgh, NY, in 2003, they found she was a bit tougher than most. This article owes a huge debt to Robert Butler for sharing his time, his memories and his photos. The work he and his colleagues did was a pivotal part of the UAL 811 story – and yet no-one had ever asked him about it. I feel incredibly privileged and grateful for the opportunity to correct that oversight. Captain Dave and I were close friends and he told me that the only thing that saved him in the entire airplane was his experience as a glider pilot he couldn’t maintain altitude And was coming down three to 500 feet a minute. Wow, thanks for that extra insight Bill. I sure wish I’d been at that presentation! Captain Cronin’s side of the story is kind of the missing element from my coverage of this airliner’s life (excluding the incident itself). It’s incredible what these people can do, to fly an aircraft that size and weight, and then repair it to full order is just amazing. Thanks for your pictures, insights and skills in getting the “bird” back in the air. Also, thank you for correcting my bad information on the Air India nose. On my final flight I took advantage of my prerogative as Captain to write a Thank You Note to all UAL Maintenance Personnel for their fine work over the years in the “squawks” section of the Log Book. That was twenty years ago this month. I don’t know if any of you in maintenance ever saw or heard how much we in the cockpits appreciate you good works. This gives me one more chance to tip of my hat to you and your fellow mechanics, you were among the best. When I was a child, I knew he went on his “field trips to fix planes”. Back then, our family was able to wish him well from inside the SFO airport. We never received all the details from these trips, and I’m so thrilled he was able to share his memories and contribute to this article. I was always in awe of him “working on the planes” – and now I know why. Hi Shylah. Welcome, and thank you for joining the conversation. Your father certainly did a great job, and it was a real pleasure to tap his memories. This particular project may have been a highlight, but he helped put a lot of planes and people safely into the air. I really got a clear sense of his fondness for – and immense pride in – the work he did. Wow! That is an incredible story! I would have loved to fly on her. What happened to her after they retired her from flying? Btw I love getting your blog posts! I’m so proud of Robert Butler. He’s always been a man of impeccable work ethics and a drive towards excellence. His love of planes (and trains) has passed through to his children, grandchildren and great-grandchildren. I love him dearly. Thanks Jet. It’s a real pleasure to turn the spotlight on Craig, even if he would never ask for it. I also think it’s important to acknowledge that he’s a representative; he was part of a really great crew on that job, and of a really amazing profession overall. Hats off is right – and to all of them. Good job Craig, only us who were there and did it know the whole and real story. you left some very good stuff out but not everyone would understand. Like container 1 Butler 0. you were a great room mate , watched Debbi N every morning. Thanks for the good memories.